Powerful, cutting-edge trading signals and strategies based on the digital signal processing research of John Ehlers, author of Rocket Science for Traders and Cybernetic Analysis for Stocks and Futures. 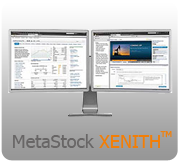 AlphOmega Elliott Waves provides custom MetaStock Experts, Indicators And Explorations. It is simple in its principles although it adheres to the popular concept of Elliott Waves and has been designed with the rule that prudence has priority over profit. Around the Horn Patterns Scans are a collection of daily pattern setups for MetaStock and MetaStock Professional a perfect companion to Dr. Manz’s bestselling book Around the Horn, this add-on will help you find easy-to-understand, resilient, high-probability trade setups. Dr. Elder's Trading Room, add-on contains the indicators found in Dr. Alexander Elder's books, "Trading for a Living" and "Come into my Trading Room," not already found in the MetaStock software. These tried and tested cycle indicators are now available to you in the Cycle Trends Plus Add-on for MetaStock. Stuart McPhee's Trade Launch Systems, is comprised primarily of two trading methods. The Altitude Trading system, and the Ignition System.